1 hour small plane charter from either Victoria Falls or Bulawayo to Bomani Airstrip or either a 4 hour road transfer from Victoria Falls or Bulawayo. Hwange’s climate and vegetation is diverse and varied. The park consists of mainly Kalahari sand desert, therefore in summer, which is the rainy season, temperatures can reach up to 45 degrees Celsius. This temperatures can then drop up to 20 degrees as sun sets, making the evenings balmy and comfortable. 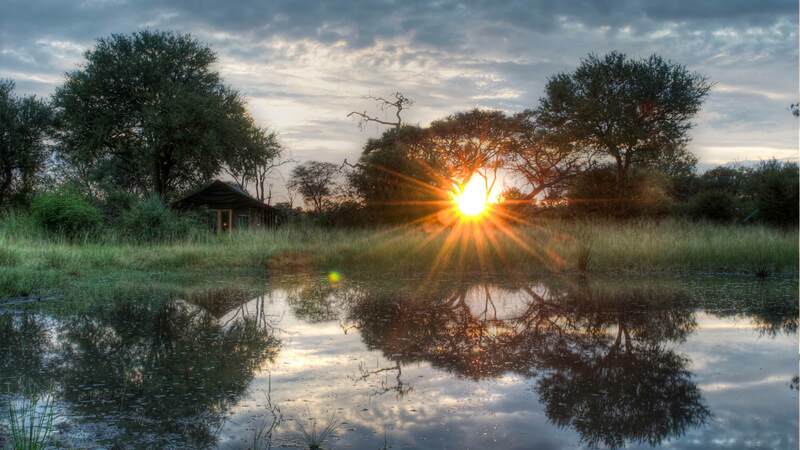 Situated in the southern side of the Hwange National Park in the Bomani Vlei, this wilderness lodge stands alone in the area. 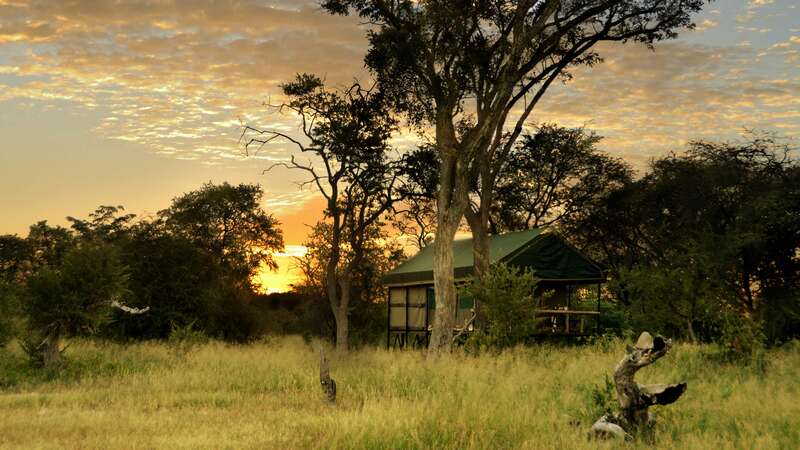 9 tents and one thatched family bungalow with an en-suite bathroom, overlooking a private waterhole which is frequented by elephants and buffalo well into the night. Five of the Serengeti tents are positioned upon spacious Zambezi teak platforms, which at five foot above ground level, offer stunning views across the open grasslands. There are no fences, simply a railway line that separates the private reserve from the Hwange National Park, therefore game roams freely between the two. 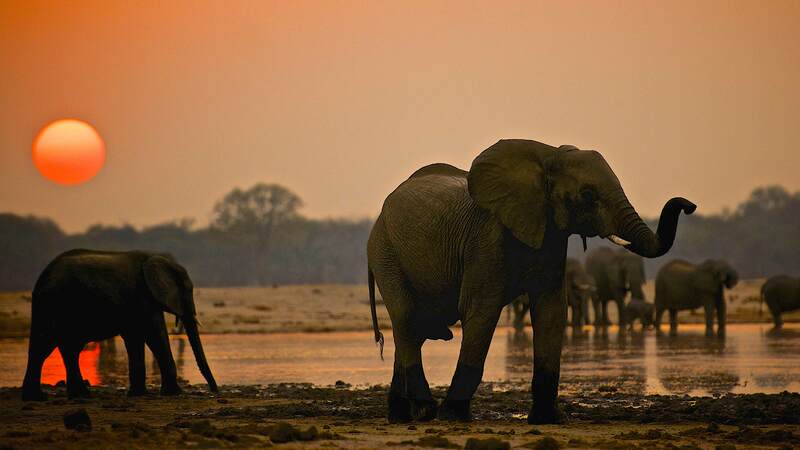 Bomani is famous for its massive herds of elephants – hundreds can be spotted in a day on safari in the dry season. Bomani benefits from being on its own private concession and guests can expect an exclusive game viewing experience during their stay. Five of the Serengeti tents are positioned upon spacious Zambezi teak platforms, which at five foot above ground level, offer stunning views across the open grasslands. The four remaining tents along with the bungalow are closer to nature at ground level. Every tent is elegantly furnished and comfortable, each with a private en-suite bathroom, hot running water, open fireplace (perfect for the winter months) and electricity. At Bomani Tented Camp, 3 meals and local beverages are provided. Picnic lunches, teas, drinks and snacks are provided during game drives and pump runs. Romantic private dining on the lodge verandas is also available on request. All the delicious meals are professionally prepared by the kitchen team at Bomani Tented Camp. Activities include game drives and walks conducted by excellent guides. In keeping with the lodge’s cultural and soci-commitments, snare tracking, borehole pumps and local community visits are all part of the experience at Bomani Safari Camp. Enjoy the sightings of Cape Buffalo and Elephant herds congregating around the waterhole at night.